Being an admirer of Jon Cattapan’s artwork for quite some time, I couldn’t pass up an opportunity today to hear him speak about his processes. The QUT Art Museum often has artist speakers on a Saturday morning after an opening, and although I live an hour West of Brisbane it is always worth the trip. Last year I was present, at different times, to hear other well known Australian artists such as Judy Watson, Lawrence Daws and Mandy Martin speak at this Museum. These were all enlightening and intimate talks and today was no exception. 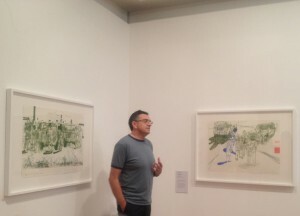 Jon Cattapan’s exhibition works were related to his time as an Australian war artist in East Timor in 2009 and he was friendly and generous and offered an insight into a prolific and engaging career. Jon talked about painting being in the land of happy accidents and also that one should never pass up an opportunity as participating will inform and impact on creative work. Commenting that while he didn’t usually plan his paintings to the degree he did with this work Jon said that the physical act of painting always takes him somewhere else. 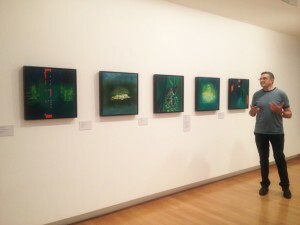 The idea to use the nightscape for this work, and the concept of green from the night vision goggles, produced an amazing vibrancy. 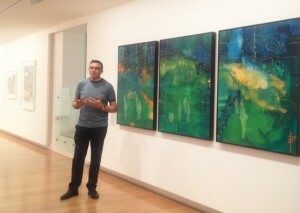 I was so pleased to be seeing these paintings in real life. The overall impressions I have gleaned from listening to artists of this calibre is that they pursue, with great passion, a vision that is very focused and committed. They are deserving of the acclaim they receive from the art world. 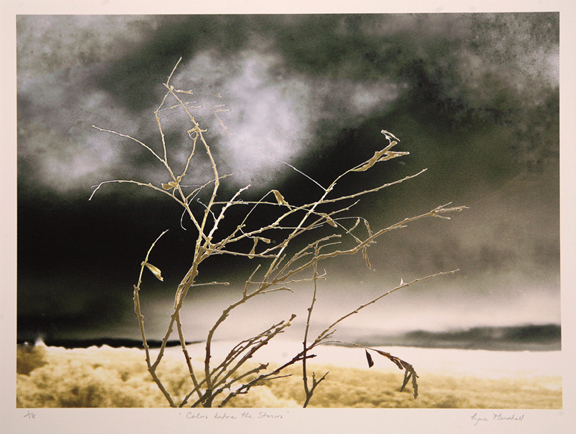 They are all prolific and I love the fact they all work with painting mediums. There is a catalogue available titled Perspectives which includes the two war artists in the exhibition, the other being eX de Medici. I also love the book I own, available from books shops, titled Possible Histories written about Jon Cattapan’s art career history by Chris McAuliffe. The exhibition runs until the 24th June at QUT Art Museum at Gardens Point Campus, 2 Goerge St Brisbane. A recent quote from long time Australian musician Vince Jones caught my eye in the Weekend Australian paper on the 18th March. Vince talked of integrity and always playing at the highest level. He said that being a musician requires dedication and practice and it was his description regarding music as art, and how art unites people, that resonated with me. Vince believes that art has an impact on people’s souls; the opaque becomes visible, the mysterious clear and the probable necessary. I have witnessed this phenomena many times. In Shanghai in 2003 I had an epiphany standing in front of a painting by acclaimed Chinese artist Zhou Changjiang. I wrote about it in 2007 in the Gleaner or Gladiator book. I remember clearly being suddenly in a spin, disappearing into the painting in such a way that it changed me forever. I have been on a mission ever since and have my own experiences of viewer’s reaction to artwork . Words and art connect. At times I unexpectedly find myself receiving confirmation of my creative journey. Recently I discovered the poems of Dorothy Walters. A retired university professor, Dorothy has written many wonderful poems and has published books including one I just ordered, ‘A Cloth of Fine Gold’. Dorothy talks of true passion in the poem What a Heart Wants. She writes of an invitation that doesn’t come with bells and whistles but arrives as a soft whisper, in a language familiar but forgotten, that requires us to put down everything and be still and wait until something inside stirs. This is reminiscent of the way American artist Cy Twombly choose to work in his studio during his long distinguished career. A more recent development in my journey is a special visit I am having in a few days time with a Shanghai couple. 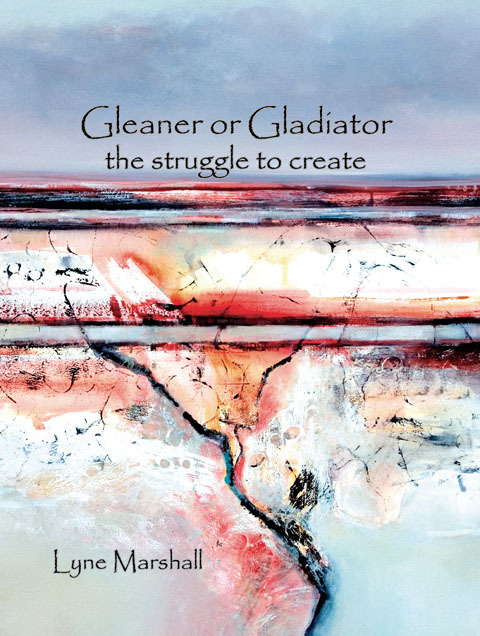 They are collectors of my paintings, and own the painting on the cover of the Gleaner or Gladiator book. On their first visit to Australia I am privileged to show them our country. The most amazing aspect of this visit is the connection that will occur, after nearly 10 years, with their long time friend Zhou Chaingjaing. Art does indeed unite people.